A fully modernised 3 bedroom Cottage, part of the historic Russell House estate. Broadway has been described as the most beautiful village in England, and the shops, restaurants, pubs, delicatessen, art galleries and antique shops are 5 minutes' walk from the property. Broadway is the perfect centre for exploring the Cotswolds. Nearby attractions include, Cheltenham Racecourse, Stratford upon Avon, both 20 minutes away, numerous historic houses and gardens, including Hidcote and Kiftsgate gardens, Snowshill Manor, Sezincote, Sudeley Castle, Stanway House, and the cathedral cities of Gloucester and Worcester. The long distance footpath, the Cotswold Way, passes through the village, with spectacular views from Broadway Tower. Broadway is home to the kennels of the North Cotswold Hunt, and horse riding, golf and hiking are all available in or near the village. 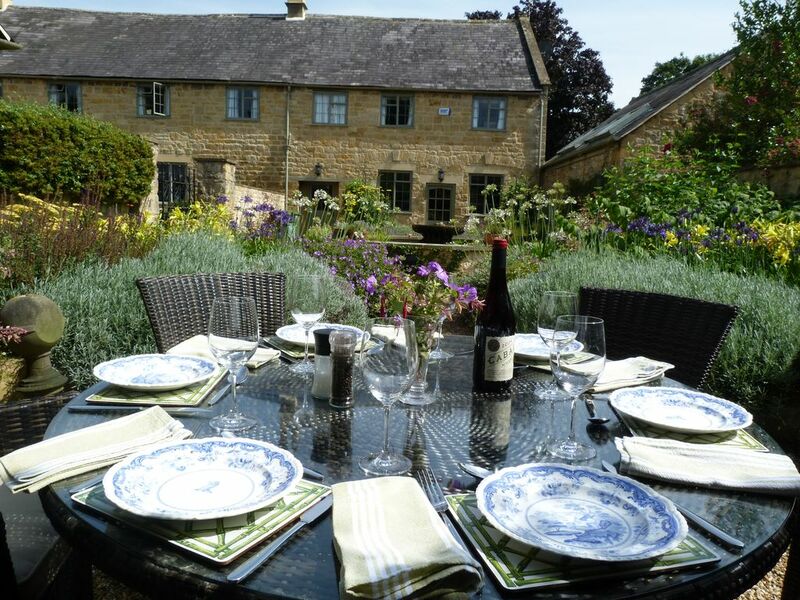 The cottage is ideally situated for the Longborough Festival Opera, only 20 minutes away (season June to July 2019), the Broadway Arts Festival, the Chipping Campden Music Festival (11-25 May 2019), the music and literary festivals in Cheltenham, and the Three Choirs Festival (26 July - 3 August 2018) in Gloucester. Broadway itself boasts two museums, the Gordon Russell Design Museum , and the Broadway Museum and Art Gallery. The ground floor has a fully-fitted dining kitchen with two eye-level ovens, induction hob, microwave, dishwasher and washing machine. Also on the ground floor is the reception room with open fire, television, and comfortable sofas and chairs with antique furniture and oriental rugs. One spacious double bedroom with four-poster bed and en-suite bath and shower room is situated on the ground floor with views of the gardens of Russell House. On the first floor is a further spacious double bedroom with four-poster bed and en-suite shower room, decorated with William Morris wallpaper. On the second floor is a cosy attic bedroom with twin single beds and en-suite shower room, elm beams and views of the surrounding gardens and of the Cotswold Hills. The cottage has full gas-fired central heating throughout, wifi, and quality furnishings and fittings, antiques and oriental rugs, and 100% cotton linens. Due to a number of small steps inside the property, it is not suitable for wheelchair users or those with severe mobility difficulties. All the showers are walk-in. I'm Andrew, originally from Cheshire, now retired, and I've been living in this area for the last 30 years. My partner and I bought Russell Court 6 years ago, and it has been our home since then. We recently bought Russell House next door and after a year's renovation project have moved there, making Russell Court now available as a holiday cottage. Well, Broadway is famous as one of the most beautiful village in England, but more than that it's a great place to live, or just to visit. Within 5 minute's walk from Russell Court is Broadway's High Street, with three pubs, six restaurants, wine bar, shops selling everything from basic groceries, men's and women's fashions, florist, a gunshop, not to mention a celebrated delicatessen, hairdressers, doctor and dentist. Russell Court is in the perfect location, and has its own central part to play in the history of Broadway. Russell Court, and the adjoining Russell House, was the centre of the Broadway Colony in the late 19th century - a group of American and British artists and writers who were the first to discover the charms of Broadway and the Cotswolds - the leading members were John Singer Sargent, whose Carnation, Lily, Lily Rose, was painted in the gardens here, Frank Millet, Edwin Austin Abbey, Henry James and Lawrence Alma-Tadema. It was this historic connection which first attracted us to the property, as we have close connections to the Boston area where many of the artists came from. We renovated the house over the last six years, putting in all the modern amenities, so that Russell Court is both historic, but with all the modern creature comforts that make it such an ideal base from which to explore the area. There are so many things to see and do in and around Broadway that a week is hardly enough! That's why I love it so much here. This is as good as it gets. Ideal, private location, very well equipped and appointed property. Idea for Broadway and around. Easy walking to the village, plenty of parking. Very spacious, kitchen and bathrooms particularly well done, all with en-suite. Thanks Steve. Hope to see you again next year, with better weather! Excellent location and place to stay. The cottage was superb, spacious, clean and decorated to a very high standard. A few minutes walk to Broadway and easy car access to other villages and towns. Look forward to returning. Thanks your comments, Kathleen. It will be great to have to stay here again! Stunning property! We stayed here over Christmas and enjoyed every single second. The owners are so welcoming and their attention to detail is perfection! They have thought of everything! Would highly recommend to everyone. We will definitely be visiting again! Thanks Emma, it was lovely having you all here and look forward to your next visit! An absolutely fantastic home with a very generous host who seemed to have thought of everything. A true delight that I will definitely be visiting again! Thank you, Susan. We'll be very happy to welcome you here again on your next stay. National Trust properties: Hidcote Manor Garden, Snowshill Manor, Charlecote Park, Coughton Court, Croome Park, Hanbury Hall, Packwood House, Upton House. Other historic homes and gardens: Kiftsgate Court, Sudeley Castle, Stanway House, Ragley Hall, Blenheim Palace, Rousham House, Warwick Castle, Compton Verney, Anne Hathaway's Cottage and Shakespeare's Birthplace, Stratford upon Avon, Highgrove, Batsford Arboretum and Cotswold Falconry Centre, Cotswold Archery at Batsford, Bourton House Gardens. Cotswold Villages: Chipping Campden, Bourton on the Water, Stow on the Wold. Moreton in Marsh. Museums: Gordon Russell Design Museum, Broadway, Broadway Art Gallery and Museum, Court Barn Museum, Chipping Campden, The Wilson Cheltenham Art Gallery and Museum, Holst Birthplace Museum, Cheltenham, Elgar Birthplace Museum, Broadheath, Corinium Museum, Cirencester. Theatre: Royal Shakespeare Theatre, Stratford upon Avon, Everyman Theatre, Cheltenham, Festival Theatre, Malvern. Music: Cheltenham Music Festival, Cheltenham Town Hall, Chipping Campden Music Festival, Three Choirs Festival, Worcester/Gloucester/Hereford. Outdoor Activities: Cotswold Way Long Distance Footpath, Walking and Hiking in the Cotswolds, on Bredon Hill and the Malvern Hills, Horse riding, Broadway Golf Club, Broadway Bowling Club, Cricket, Hunting, Fishing, Cycling, Gliding, Tennis, Polo, Archery. Shopping: Broadway Village, Cheltenham, Stratford upon Avon, Bicester Village Outlet Centre, Daylesford Organic Farmshop, The Valley, Evesham. Pubs and Restaurants in Broadway: Russell's Restaurant, Russell's Fish and Chips, Swan Hotel, Broadway Hotel, Lygon Arms Grill, Lygon Arms Wine Bar, Crown & Trumpet, Swan Inn, Broadway Indian Restaurant. Favourite Gastropubs and Restaurants nearby: Churchill Arms, Paxford, Ebrington Arms, Ebrington, Horse and Groom, Bourton on the Hill, Lion Inn, Winchcombe, Seagrave Arms, Weston sub Edge, Fleece inn, Bretforton, 5 North Street, Winchcombe, Champignon Sauvage, Cheltenham. Other local attractions: Adam Henson's Cotswold Farm Park, Cotswold Wild Life Park, All Things Wild, Honeybourne, Stratford Butterfly Farm, Birdland, Bourton on the Water, Cotswold Distillery, Cotswold Lavender Fields and Shop.